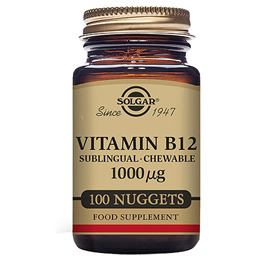 Solgar® Vitamin B12 Sublingual - Chewable 1000mcg Nuggets contain 1000mcg of the cyanocobalamin form of vitamin B12. It plays a number of different roles in the body such as reducing tiredness, assisting in the release of energy from foods and supporting your vitality. Presented as sublingual nuggets (that melt under the tongue), this product is a convenient, easy to take version of this versatile nutrient, particularly important for those with a restrictive diet (such as vegan). Beyond energy, vitamin B12 has several health benefits supporting general vitality and wellbeing. 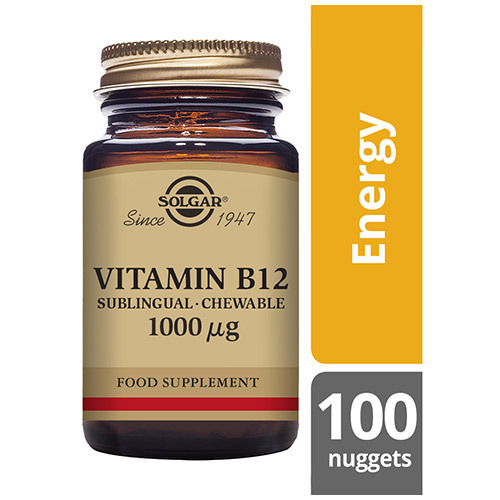 Solgar® Vitamin B12 delivers 1000mcg in just one nugget daily, promoting the health of the nervous system and healthy blood cell formation, and support energy metabolism. Vitamin B12 is naturally found in fish, dairy produce, organ meats, beef, pork, fortified foods and is a water-soluble vitamin. 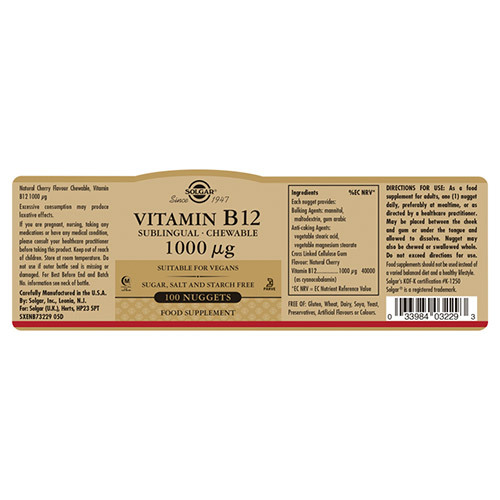 Vitamin B12 is necessary to maintain energy and general vitality and has numerous health benefits. 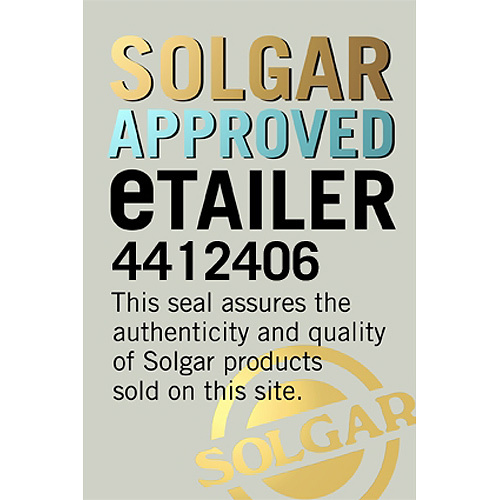 Solgar’s nuggets are taken sublingually (dissolved under the tongue), which means the B12 bypasses the stomach and is absorbed directly into the blood. Bulking Agent: Mannitol, Anti-caking Agents: vegetable stearic acid, vegetable magnesium stearate, Cellulose Gum. Free Of: Gluten, Wheat, Diary, Soya, Yeast, Preservatives, Artificial Flavours or Colours. A food supplement for adults, take 1 nugget daily, preferably at between meals, or as directed by a healthcare practitioner. May be placed between the cheek and gum or under the tongue and allowed to dissolve. Nugget may also be chewed or swallowed whole. Do not exceed directions for use. 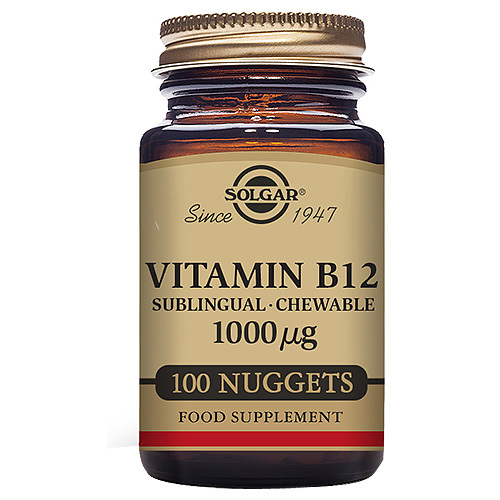 Below are reviews of Solgar Vitamin B12 - Cyanocobalamin - 100 Nuggets by bodykind customers. If you have tried this product we'd love to hear what you think so please leave a review. Very good product. I have an autoimmune illness and I feel better with this product. I can recommend it. Makes sense to use the best !! I have been taking these for a few weeks as I thought I had lost my get up and go. After a week I felt more like myself again and there is no way that I will stop taking them now. They are small and easy to take and just one a day is all that is needed. I would recommend these to anyone requiring Vitamin B12.